John Lewis Pacella was born to an Italian /American family in Brooklyn New York, on September 15, 1956. When he was ten years old his family moved out to Suffolk County on Long Island, where he attended Connetquot High School. 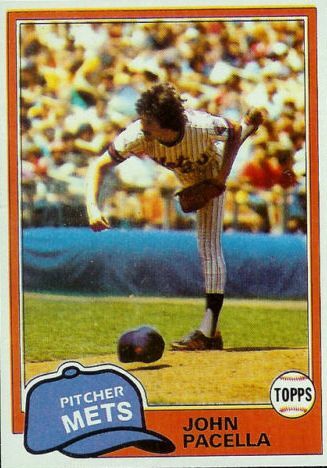 There he played ball in the Ronkonkoma/ Bohemia school district, getting drafted in the 4th round of the 1974 by New York Mets. 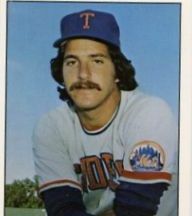 Pacella was another Brooklyn native on the late seventies Mets teams, along with Lee Mazzilli, Joe Torre, Pete Falcone & Coach Joe Pignatano. 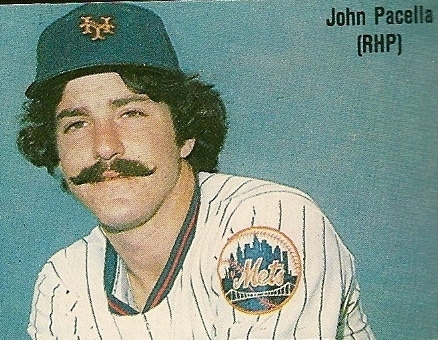 Pacella was also another character in Mets history that is more remembered for certain antics than for his pitching. His appearance made him look more like he sang in a barber shop quartet, as he sported a handle bar style mustache in the late seventies. He rivals Keith Hernandez for the best Mets moustache of all time. Pacella’s other claim to fame was that he threw the ball so hard; his cap would usually fly off his head after his delivery. There is proof of that is on his 1980 Topps baseball card, as he is pictured throwing the baseball with his hat falling down onto the mound. He said one time, a ground ball landed in his cap and bounced to the second baseman. The infielder threw the cap aside pulled the ball out & got the out at first base. In 1976 at A ball Lynchburg , Pacella won 12 games while losing 11. He was promoted up the ranks of the minors in 1977 winning ten games overall. At AAA Tidewater he had seven wins going 7-5 with a 3.68 ERA. Pacella was promoted as a September call up, making his debut at Philadelphia on September 15th pitching two innings of relief. He made three appearances on the year. The next season he started the year at AA Jackson going 4-3 getting promoted to AAA Tidewater where he went 4-11. In 1979 after a 7-10 record at Tidewater he got another September call up. On September 18th he gave up two runs to the Chicago Cubs taking a loss as Rick Reuschel shut out the Mets 2-0, in the first game of a double header. In 1980 Pacella started out the year in the bull pen but got into the starting rotation by early June. He earned no decisions in his first four starts & then on June 17th he got his first career win at Philadelphia. He pitched six innings allowing two runs in a 3-2 Mets win. In his next start he allowed just one run pitching into the 8th inning, earning a win against the Chicago Cubs. Pacella went to 3-0 before losing his next four decisions, closing out the year at 3-4 with a 5.14 ERA. He struck out 68 batters with 59 walks in 84 innings pitched for the 5th place Mets. That December he was traded to the San Diego Padres for pitcher Randy Jones. Pacella would not pitch in San Diego, he was traded to the A.L. New York club at the end of Spring Training 1981. 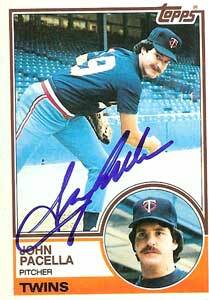 Pacella ended up pitching just three games there, then was traded to the Minnesota Twins in the Butch Wynegar deal. 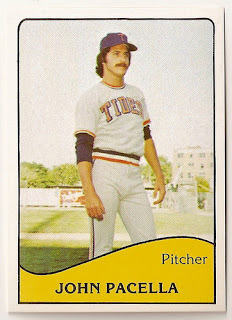 He went 1-2 to finish the year, then pitched in the minors in 1983. He was sent to the Texas Rangers but was released & then got signed by the Baltimore Orioles in 1984. He was released there as well & signed with the Detroit Tigers pitching in just five games in 1986. 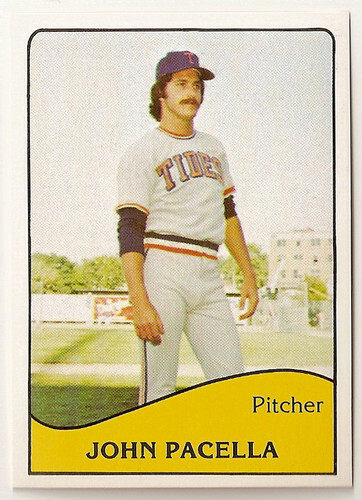 Pacella went to Japan to pitch for the 1987 season but then had arm trouble which finished off his career. Retirement: In six seasons he was 4-10 with three saves in 74 appearances. He struck out 116 batters while walking 133 in 191 innings pitched. After his pitching days he went on to manage a few Independent Baseball League teams including the Newark Bears. Pacella also operates a baseball instructional school.